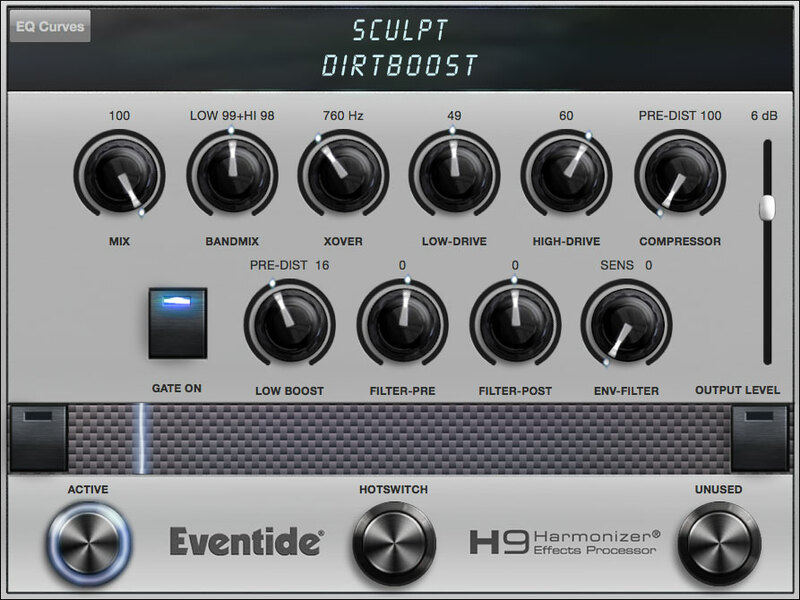 Sculpt is a multi-band distortion algorithm that gives you a degree of control that would otherwise require 3 or 4 pedals or complex plug-ins. Sculpt does this by carving the audio signal into high and low frequency bands and then allowing different levels of gain and filtering for each. This multi-band approach has been used by professionals in the studio and on stage for many years and now we’re making it available to anyone with an H9. Follows a player's style and compliments their playing with tunable peaking filters. Unique view in H9 Control that allows you to visualize and control the parameters of the effect in realtime. The clean/dirty mix, all the way left is clean, all the way right is dirty. The mix between the low and high band. The crossover frequency where the low band and high band are split. Overdrive of the low band signal. Overdrive of the high band signal. Compression which is Pre (turn left) distortion, or Post (turn Right) distortion. Turn left to juice up the harmonics in the distortion, or turn right for some sparkly compressor spank. The Sculpt compressor is specially designed to vary the numerous parameters of a typical compressor such as the ratio, attack, release and the makeup gain to keep the overall loudness consistent. Boosts the low end either Pre (turn left) distortion for chuggier low end, or Post (turn Right) distortion for smoother low end. Peaking filter before the distortion. Turning left sweeps a cutting filter up in frequency. 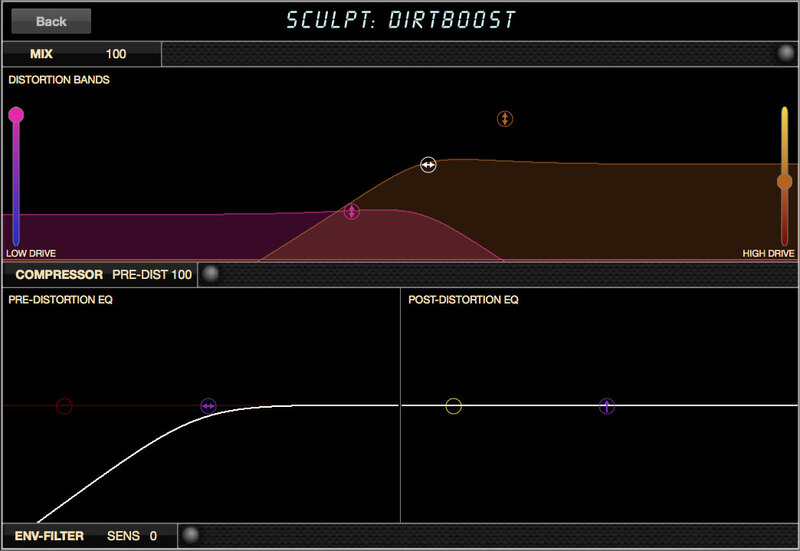 Turning right sweeps a boosting filter up in frequency, similar to having a parked wah before the distortion. Smoothly changes when connected to an expression pedal. Peaking filter after the distortion. Turning left sweeps a cutting filter up in frequency. Turning right sweeps a boosting filter up in frequency, similar to having a parked wah after the distortion. Smoothly changes when connected to an expression pedal. Envelope follower that modulates both [FLTPRE] and [FLTPST] according to this input sensitivity setting. The values of [FLTPRE] and [FLTPST] become the depths that the envelop glides up to. Interesting dynamic changes are achieved when pre and post and set to opposite sweeps, e.g. Pre boost, and Post cut, etc.